Among the types of fraud are those that concern Medicare/health insurance. The main goal in these types of scams is to get older people to give them their personal information or to provide bogus services at makeshift mobile clinics, and then use the personal information they provide to bill Medicare and pocket the money. Scammers have targeted seniors for numerous rip-offs surrounding the Affordable Care Act and Medicare enrollment. Since every U.S. citizen over the age of 65 qualifies for Medicare benefits, seniors are an easy target for medical scams because criminals don’t have to do any research around their insurance provider. Many of these scams operate via door-to-door or over-the-phone solicitations by someone claiming to be a Medicare representative. Here are some ways to spot a medical scam targeting a senior: Being told you need a new Medicare card and must divulge your Social Security number. Being told you need new supplemental policies. Being asked to pay a $100 fee for help navigating the new health care landscape. When in doubt, just hang up the phone or shut the door on the person trying to get money from you. Another profitable area is in counterfeit prescription drugs. These happen commonly on the internet where people increasingly go to find better prices on specialized medications. The danger is that besides paying money for something that will not help a person’s medical condition, victims may purchase unsafe substances that can inflict even more harm. This scam can be as hard on the body as it is on the wallet. Purchase only from reputable sources and keep yourself safe. March 21 Suspicious: The caller reports two males trying to break into a vehicle at 12:14 a.m. in the 800 block of Del Sol Drive. DUI: The call is reported as reckless but the inebriated driver insists that is total exaggeration at 11:54 p.m. in the area of Railroad Pass. Thought for the day: The two males are located and, after proving one is the owner of said locked vehicle, left to continue their attempt to gain access to the cab and the keys. March 22. Petty theft: Several items are found missing at the start of the business day at 8:56 a.m. in the 1500 block of Foothill Drive. Suspicious vehicle: Officers are dispatched to the area where a suspicious vehicle appears to be taking items and is also suspected in past thefts at 10:10 p.m. in the area of U.S. Highway 95 and Silverline Road. Thought for the day: The very surprised security company assures officers that their presence is to prevent just such an issue. March 23. Assist: The cab driver has an unconscious and inebriated occupant and just wants the fare at 7:51 a.m. in the 800 block of Buchanan Boulevard. Thought for the day: Officers are able to rouse the pickled party, assist the driver in getting paid and delivering the subject home. March 24. Suspicious: The caller is out of breath in chasing a subject on foot who was inside his vehicle at 9:12 a.m. in the 1300 block of Capri Drive. Wanted: The caller states someone is attempting to use a credit card reported as stolen at 8:28 p.m. in the 1000 block of Nevada Way. Thought for the day: The owner of the credit card advises it was stolen at a casino in Las Vegas and the suspect is detained on existing warrants in the meantime. March 25. Domestic: The man and woman are making quite a few friends with all the screaming at 1:33 a.m. in the 800 block of Avenue B.
Domestic/cold: The offending party is finally located from the early morning melee at 9:47 p.m. in the 900 block of Nevada Way. Thought for the day: It may take a minute but you will get to speak to the Thin Blue eventually. March 26. Grand theft: The moral of the story is don’t leave a very valuable bike in an unlocked vehicle for the night at 2:48 p.m. in the 1000 block of Arizona Street. Welfare: The subjects had a disagreement and now one party cannot locate the other at 8:24 p.m. in the 500 block of Lake Havasu Lane. Thought for the day: It’s always interesting how each side has a spin on the other party and are astounded when the officers question the story. March 27. DUI: The caller’s report offers step-by-step indications the caller is inebriated at 1:49 a.m. in the 700 block of Nevada Way. Attempted robbery: The subject gives the teller a note but leaves with only the money he came in with at 11:53 a.m. in the 400 block of Nevada Way. Thought for the day: The confusing note nets the robber no proceeds and the next attempt from another jurisdiction gets the same results. It’s time to try a new vocation, I think. Call of the week: Suspicious: The caller states the box alongside the road contains bloody clothing and may be a part of a crime. The officers respond and determine that the box of costumes does, in fact, have much fake blood that is bright red in color and dry and any potential crime might well be part of the charade at 3:14 p.m. March 26 in the 1600 block of Boulder City Parkway. 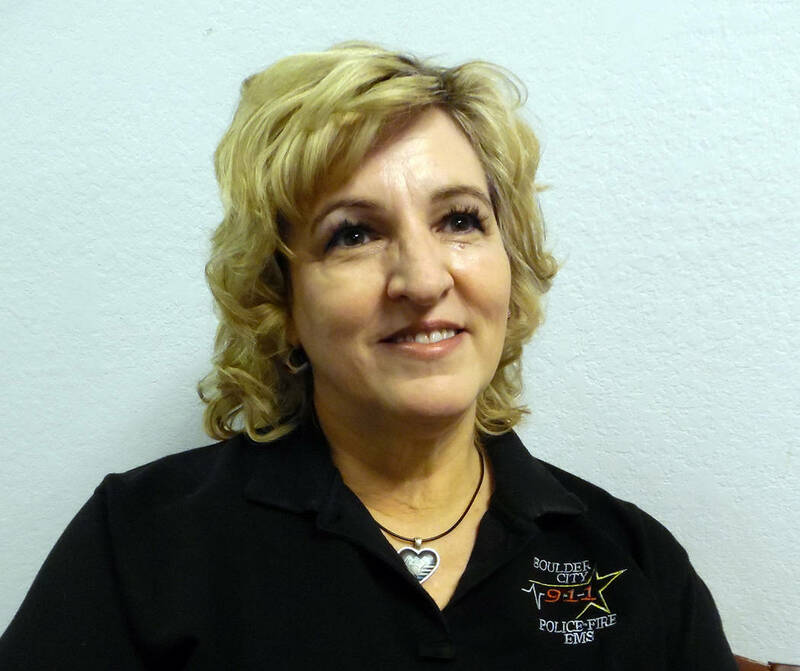 Tina Ransom is a dispatcher with Boulder City Police Department. She is coordinator of the Boulder City Citizen’s Academy.